For the enhanced growth and development of dairy replacement calves. Driving milk production and health. For more than 55 years, Grand Valley Fortifiers has been helping to develop and revolutionize the dairy industry. GVF is now actively providing Dairy Farmers across Canada with advanced animal nutrition products for improved human health. While our range of dairy nutrition products is continually updated and improved our goal of enabling producers to obtain the best possible production, at the lowest possible cost, remains the same. Learn more about our dairy products below. LifeLaunch 4C is a milk-based calf starter designed to improve early solid feed intake in early life. This translates to increase average daily gain (ADG) and reduce post-weaning growth slump. Just a handful of LifeLaunch 4C each day until weaning launches a cow’s lifetime performance. The research trial recently completed showed that calves fed 6L of milk replacer and LifeLaunch 4C™ ate over 50% more solid feed before weaning, grew 16% faster from birth to weaning, and had over 200g/d greater average daily gain during the weaning period, compared to those not fed LifeLaunch 4C™. LifeLaunch 4C™ is designed to get calves onto solid feed sooner and gaining weight faster, while helping to avoid the post weaning slump. When calves are consuming 150g of LifeLaunch 4C, provide your existing calf starter in addition to allow ad-libitum intake. 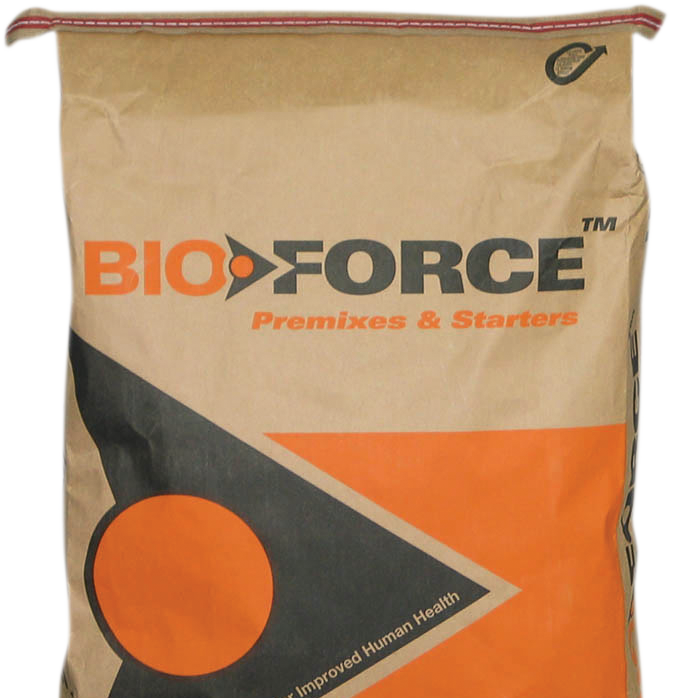 Bio-Force® Acidified Milk Replacer is acidified with a unique blend of high quality organic acids which effectively lower the pH of the milk. Dairy producers feeding properly acidified milk replacer at recommended levels for enhanced growth, report that calves grow faster and are healthier compared with feeding conventional nonacidified milk or milk replacer. Bionic® dairy premixes contain research proven organic additives including rumen specific live yeast, chelated minerals and selenium yeast. Bionic® dairy premixes contain optimum phosphorus levels for lactation and farm nutrient management. Bionic® Calf Starter and Grower are the next step in the complete calf program from Grand Valley Fortifiers. These feeds are designed to increase future profits by growing calves to their full potential and getting them into your milling herd sooner. The Robolac™ line of robotic milking dairy products from Grand Valley Fortifiers have been specifically formulated to meet the nutritional needs of lactating dairy cows milking on robots. This highly palatable feed attracts cows to the robot more frequently resulting in increased feed intake and fewer cows needing to be fetched. Increase the flexibility of your feeding program and extend the supply of your own corn or grains with the new line of Robolac™ robotic milking nutrition products. There are four different Robolac™ products specifically designed for the type of robot and cow traffic pattern used on your farm. EcoLac® dairy premixes are formulated with your cow’s optimal nutrition and performance in mind. EcoLac brand premixes are the backbone of Grand Valley Fortifiers dairy premix products. They have been developed to maximise cow health, milk production and feed intake all while reducing the cost of producing a litre of milk. Optimum formulation of all required minerals and vitamins for lactation and health. Six different formulae available to match various forage programs. Millennium® dairy premixes contain the same highest quality ingredients as our EcoLac® line but with the addition of organic ingredients to maximize feed intake and reproduction health. Increased production – research proven to increase milk, fat and protein yields. Increased rumen bacteria growth results in greater feed intake and feed efficiency. Improved Reproduction and Udder Health – research proven to increase pregnancy rate and reduce somatic cell count. Convenient to feed – with all minerals, vitamins and optional additives in one package. Bulk delivery results in additional convenience and cost savings for larger herds. A unique combination of select plant extracts specifically formulated for lactating dairy cows. Natural Edge is research proven to maximize milk production and butterfat is designed to compliment the EcoLac™, Bionic®, and Millennium® premix programs.